When I was in my early 20s & backpacking around Europe, I had visions of what dreamy landscapes & majestic castles I would see. While Italy and Greece were at the top of my list for countries to explore, one image stood out in my mind as the best of Europe; it was Neuschwanstein Castle. I couldn’t imagine anything more beautiful. Pictures didn’t seem real. I needed to see it for myself. I never made it to Germany on that trip so Neuschwanstein remained on my bucket list for more than a decade… until yesterday! I finally made it to my fantastical castle & it was everything I imaged. Sitting high above the village of Hohenschwangua near Fussen, Germany is Neuschwanstein Castle. This 1800s Romanesque revival was once the home of introverted King Ludwig II of Bavaria, but after his death it was opened for public tours. More than 60 million people have visited the castle and I’ve always wanted to be one of them. Yesterday my bucket list dream became a reality. We took the bus to the foot of the castle and witnessed its grandeur from Queen Mary’s Bridge. It’s that vantage point that has produced the most famous photos of the castle. I stood in shock. It was massive and much more impressive than any picture could produce. Seven stories of sheer brilliance stood before me. I wanted to get closer. With flat lands on the north side of the castle and the Alps in the south, the vistas that surround the castle are equally as impressive as the castle itself. This is what dreams, and Disney movies, are made of. To complete the fantasy, we rode a horse drawn carriage down the mountain to our vehicle. I figured it was fitting in the magical surroundings, and to say Athena was excited about it would be a gross understatement. I now see Neuschwanstein Castle with new eyes – my own. Dream about the most amazing and unbelievable things in life because that’s what becomes your reality. This entry was posted in Europe, Germany, Travel, Uncategorized and tagged bucket list, bucketlist, Fussen, Germany, Lesley Carter, Neuschwanstein, Neuschwanstein Castle, photo, photography, travel by lesleycarter. Bookmark the permalink. I so need to come back, as I did the “Castle tour” – all the bavarin ludwig castles- with my parents when I was too young to remember it proper. Sadly we do have currently school holidays so I’m stuck in the office during the week 😦 – and yes I would have been nice to see you again! The castle is great. You can clearly tell that Ludwig was a total nutcase, but the building has come right out of a fairytale! How great it must have been for Athena! Some places are fulfilled with dreams, expectations, emotions, ideas. You don’t understand why, and doesn’t happen with everything. Once you can reach them and see them with your own eyes, and reality is more beautiful than the imagination… Then it’s wonder. It happened to me in Canada. Another one is Iceland, but I have to see it with my own eyes yet. Speaking about Neuschwanstein, it’s not that far from here, I should visit it soon! Enjoy your dream! When I was 13 I was lucky enough to make a wonderful trip from Vancouver to Montréal. At that time I could’t speak a single English word but I felt in love with the country. It was so unforgettable. I’m glad to see the scaffolding is gone so you could enjoy it in all its glory. The last time I was there the entire side as viewed from the bridge was hidden by metal scaffolding. Fortunately I had also been there two years prior, so I got my good pics then, though the trees surrounding the castle are much more lush in your photos (I saw it in early spring). Someday I want to go back when I have time to hike to the top of the nearby mountain, from which the iconic photos of the front of the castle are taken. Thanks for the memories! I lived in Germany for 10 years and LOVED it! My bucket list includes going back to live one day. PERMANENTLY! It is a wonder! Absolutely gorgeous piece of Real Estate!!! You made it! Bravo. Stay safe. Cheryl. Hi Lesley, I lived just up the road from the Castle, Windsor is a great little town. Ah, seeing this reminded me of my own memories. Great castle! That’s one more thing I want to put on my bucket list. wow what an incredible castle! My mother is German and I went to Germany when I was 21. I couldn’t get over how people live, work, and play in a country so full of history. I went into sensory overload! Wow! This is so lovely. glad you both made it there and got inside for a tour. i too enjoyed the scenic view. too bad i missed the last ride down with the horse-drawn carriage. i had to walk instead. We visited Neuschwanstein about 6 weeks ago. I’m really glad you enjoyed it, because, to be absolutely frank and honest with you, my husband and I didn’t really. In your post, you’ve condensed the history of the place (quite rightly), but King Ludwig lived in it for only a year (unfinished, surrounded by empty rooms) before being certified insane and then being found dead in a lake with his psychiatrist the following day. Almost immediately after that, the government of the day started allowing in visitors to recoup the building costs, so the castle has been a tourist site for almost all of its life. You write ‘This is what dreams, and Disney movies, are made of.’ That’s about it. You’re very well travelled, Lesley, so I’m sure you’ve visited REAL castles in England – Colchester Castle, for instance, which played a significant part in the English Civil War and which, incidently, has been refurbished this year. There’s no comparison! I have visited castles in a number of fantastic locations, but the pictures of Neuschwanstein always remained in my mind when dreaming of Europe. It was what I saw as a child, making it high on my list of places to experience. I know the history isn’t as incredible but it was more about the journey to see it for myself. That is amazing! How do you save for the trips? I’m hoping to go abroad with my family! I got to visit this castle when visiting Europe on a high school band trip. As cool as I thought it was then I would love to go back as an adult because I’m sure I would appreciate the things I got to see then much more now! Congrats on finally getting to see this sight! Beautiful post! Makes me want to visit castles too! I never gave Neuschwanstein Castel much thought. Now I will add it to my list. Thank you for the inspiration. I had the chance to visit the castle when I visited Munich but I chose to stay in Munich and visit the city while my friends went off to visit the castle. It can be done as a day trip from Munich but it’s a day-long trip–I think the train takes about two hours to get there. I don’t regret my decision at all, since I have an excuse to go back to Germany. 🙂 I also think the king that commissioned the castle Ludwig II was very eccentric or something? He also died under very mysterious circumstances after he was forced to step down as king. I’m all about the tragic royal historical figures. That’s so gorgeous that it doesn’t feel real. The way the castle rises out of the mountain and ascends from a sea of trees…Holy crap. You have bumped this one off of your bucket list and onto mine! It is stunning to see in person. I visited Neuschwanstein when I was 20 and backpacking Europe during spring break while studying abroad in Germany. Like you, it was one of the sights of Europe I just HAD TO see. 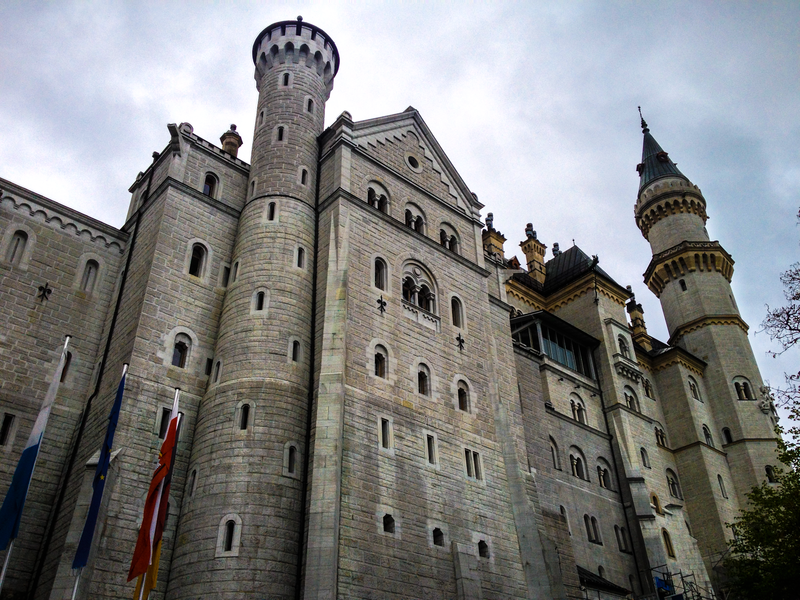 I can certainly see Disney’s inspiration for Cinderella’s castle, which was probably another reason my 20-year-old self couldn’t leave Munich without a day trip to King Ludwig’s castle. It sounds like you enjoyed your visit. Doesn’t it feel wonderful to finally cross that off your bucket list? Been there once planing on going again. I live in the USA, would love to Trek through that area, looks like a lot of fun. It is so beautiful! Your travels are amazing! My 15 year old designed a 3-D printed version of it last year in her school Space Program. So we have a little blue plastic version sat on a shelf! This castle is definitely on my list, too…such an imposing architecture! I wish I had the time to travel 🙂 A friend of mine posted some amazing pictures she took there. Fortunately for her, she lives nearby.